We are pleased to offer to our patients CEREC restoration services, a method of creating precisely designed, color matched and highly durable ceramic restorations right in our office. From simple fillings to full crowns, CEREC delivers the results you need in one appointment. After examining the tooth and determining the course of treatment, we will prepare your tooth for restoration, similar to traditional methods. 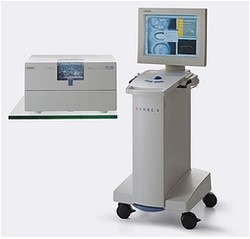 CEREC then uses a state-of –the art digital 3D camera to create an optical impression. This allows us to design every precise detail of your restoration with the accuracy you've come to expect from our office. The software allows us to customize the shape of the restoration to exactly fit your specific tooth. While you wait in the comfort of our reception room, exact design specifications are sent to our on-site milling machine to create your restoration. About 30 minutes later, your all ceramic, color matched restoration is ready for placement. It is fitted, polished and bonded for permanence. Your tooth is restored back to its natural form and function. All in one single visit to the dentist! !